Hi all! I'm back with another day of MFTeasers! This is DAY 4! Only one more day before release time! Be sure to come check out all the new release sets on November 4th at 10:00 PM EST HERE on the MFT site! This card uses the set, Cool Yule. I used all 3 "chilly" animals that come in the set and created a Polar Totem Pole! :) I stamped the "ice pond", polar, penguin and bird all separately and then colored them and cut them out. I added paper piecing to the polar bear, and flock to the penguin and bird. My favorite part of this card is the iced-over pond. 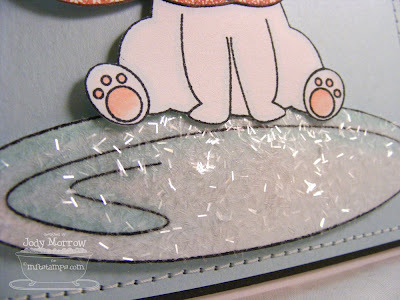 I used some new clear tinsel glitter I found at Michael's adhered with a thin layer of Diamond Glaze. Be sure to check out Kim's blog HERE for a complete list of design team members with an MFTeaser for today! You'll want to check out their creations using this set! Jody, you never disappoint when I come here! Seriously, that is adorable! Oh and you are always enabling me on SOMETHING...like that tinsel glitter! ACK! Love that look!! OMG, jody!!! this is so cute! love the way you stacked the animals...i gotta get these stamps! thanks for enabling me, lady! LOL! Just the cutest Jody, I love all your sweet samples this month for MFT!! So So Cute Jody!! just found your site today, and I am loving it! Thanks for sharing. This is seriously cute Jody! I love it! OMGosh!! I love how you stacked them!!! To stinkin' cute! I love this card, I can't wait to get my hands on that stamp! Love how you made the totem! Those little animals are to cute and I love that glitter! I see a trip to Michaels! great card! I can't wait to go broke tomorrow, each set is cuter than the next. Your totem is AMAZING!! Love that glitter! As usual, super-cute, super-creative and I love the sparkly ice! This is fabulous, Jody! SO cute! 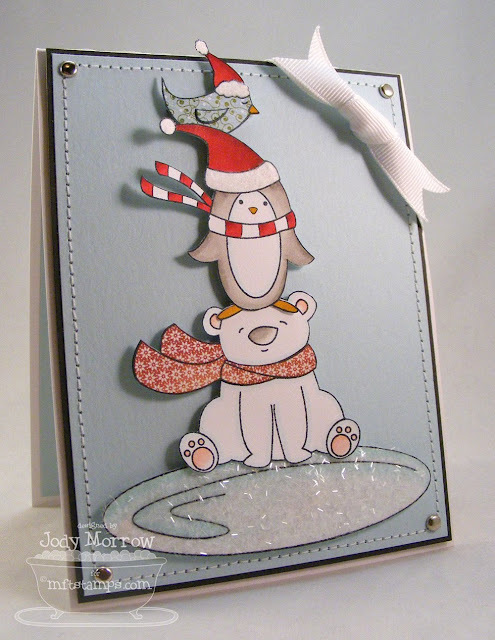 LOVE the glittering ice and your totem of cutie patooties! Jody, only you would think of a totem pole for this set!! LOL Thanks for the smile. I needed it. Hey Jody, I know you already have a lot of followers and most of mine probably already follow you but I gave you a shout out on my blog tonight, thanks for pointing me towards the Swanky Stamper today. That was the highlight of my day. Wow...this IS CLEVER!!!! LOVE LOVE LOOOOOOOOVE it!!!! This card is totally awesome. This totem pole is very unique and cute.